How do I reseal stamped concrete? Ok, I get it, your stamped concrete is looking a little faded, blotchy, or even kind of whitish on the surface. And you want to restore it to its original look when the concrete was first sealed, right? In theory, resealing your stamped concrete should be quite easy, but if you're not careful, resealing it might make it look worse. Does your sealer look like this? How could applying new sealer make my concrete look worse? Concrete sealers are designed to be applied very thin. The manufacturer specifies on the label how many square feet per gallon of coverage. If they specify 300 square feet per gallon then that's what you should do. If you think applying it at 200 square feet per gallon is better because it's a litte thicker, you're wrong. Most sealers used for exterior stamped concrete are solvent or water based acrylic sealers. They are designed to allow moisture vapor to pass through them. If you apply them too thick, moisture will get trapped on the surface of the concrete and under the layer of sealer causing "blushing" or whitish looking sealer. SHOULD I RESEAL MY STAMPED CONCRETE? Well the answer to that is yes. But we just don't want to make it look worse. If you're like me, you like your stamped concrete looking new, clean, and either shiny or with more of a matte finish. There's just some things we have to do before we re-seal your stamped concrete driveway, patio or pool deck. Can I use a pressure washer to clean stamped concrete? Well the simple answer to that is yes! I recommend using a pressure washer but with a certain kind of tip. Disclaimer: Some of the links on this page are affiliate links. If you click on the link and purchase the product I receive a small commission. Thank You! A 15" rotary surface cleaner will connect right to the end of your wand and a 3100 psi pressure washer will give the surface cleaner enough power to thoroughly clean the surface of the stamped concrete. You're not trying to remove all the original concrete sealer. You just want to remove the dirt, tree pollen, mold & mildew and debris from the surface. In the process of doing this, this surface cleaner will also remove any old, loose, and flaking sealer that was originally applied. If you feel like you still have some dirty areas after using the surface cleaner and you need to scrub the surface, you can use a stiff bristle broom and Dawn dish detergent or Simple Green mixed with water in a 5 gallon bucket. Either way, Just rinse the concrete really good so no residue remains after it dries out. When you're done cleaning and washing the concrete it's very important you let it dry out. Wait at least 24 hours, 48 would be better. Even though the concrete looks dry on the surface, there's still a lot of moisture internally. Most of the time, if there are any problems with old sealers, it's from solvent acrylic based sealers. Water-based concrete sealers mostly "soak into" the concrete and don't leave much of a film on the surface. The concrete looks pretty much the same after sealing with a water based sealer as it did before the sealer was applied. A lot less goes wrong with water based sealers but, in my opinion, they just don't give stamped concrete that "wow" look after its been sealed. messy and can be expensive if you have a lot to do. In some cases it may be necessary, like if the sealer has a thicker, plastic look to it and it turned mostly white. But most of the time it's not. All you have to do to re-seal is make sure the new sealer has good adhesion to the old sealer. What type of sealer should I use to adhere to the old sealer? Most stamped concrete contractors like myself use solvent acrylic based sealers on our stamped concrete projects. The solvent sealers make the colors "POP" and generally work the best. Especially for exterior stamped concrete. I recommend a high gloss acrylic solvent based concrete sealer. The solvent based sealer will help make the stamped concrete look like "new" again. I use sprayers plus 20ACT acetone concrete sealer sprayer This pump up sprayer will give you a nice even spray when applying the sealer. It's also made for sealers that contain acetone, xylene and other strong solvents. Lesser quality sprayers will not work properly with concrete sealers made with acetone or xylene as the solvent in them. We clean out the sprayer with the same solvent that's in the sealer (straight acetone or xylene) and you can re-use it over and over again for years. Sealing the concrete - What to do first! OK, ok, so you've got your concrete clean and dry. You've got your sealer and sprayer ready to go. Fill the sprayer about 3/4 full, tighten the top and pump up the sprayer until it's really hard to pump. It's got to be a nice day out with no chance of rain in the forecast. The best time of day is late afternoon when the sun is setting and the temps are 70 - 80 degrees F.
NOTE: You can also apply the sealer with a 9 or 18 inch paint roller. Don't forget the roller frame and tray if you decide to do it this way. I personally prefer spraying the sealer, I think you can apply it thinner and more evenly with the sprayer. Start at one end and work your way backwards to the other end. Spray the sealer in a circular motion. Don't over spray, keep it very thin. You're going to spray a 2nd coat so you'll get good coverage. The best method to apply the sealer is to spray it and have someone right behind you back-rolling with a paint roller. Kind of think of it as mixing the new sealer into the old sealer. The new sealer must mix with the old in order to release trapped moisture (those white areas) and reactivate the previously applied sealer. Reactivating the old sealer will melt the ugly, flaky, and blushing areas all at once, releasing any moisture and making it look like new again. The reactivating process requires a little more than just a pump up sprayer application. You are going to have to agitate the sealer as you apply it. By agitating, I mean having someone back-rolling. Solvent based sealers usually dry very fast, so you won't have much time to agitate. It's best to do the worse looking areas first, let them dry and then reseal the rest of the stamped concrete. Back-rolling the sealer will also keep you from getting any puddles. Puddled areas of new sealer will be too thick and could trap moisture. How much sealer will I need? Whenever I seal or reseal stamped concrete, I like to go very thin with the first coat. I might spray it on as thin as 500 sq. ft. per gallon. It's so thin, it looks like I'm missing some areas. The goal is to use as little as necessary to get the job done. Less problems that way. one at 400 sq. ft. per gallon. How often do you need to re-seal stamped concrete? Most of the time, every 2 - 3 years. I depends on things like, foot traffic, sunlight, and weather conditions. Acrylic sealers just aren't designed to last forever. The sun degrades them, foot traffic wears it off, and harsh weather conditions will eventually make it whiten or flake off. Maintaining the stamped concrete by keeping it clean and re-sealing when needed (2 - 3) years, will keep the concrete looking as new as possible. 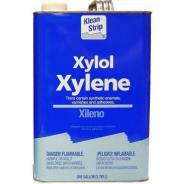 Can Xylene be used on stamped concrete? TIP: To clear up whitened, cracked, and hazy looking concrete sealer, sometimes it's better to try and re-melt the existing acrylic solvent based sealer with an application of xylene (xylol). Xylene is a strong solvent that re-wets acrylic solvent based concrete sealers making them look new again. first, you may get the original sealer to look smooth, shiney and clear without adding another coating of sealer. What xylene won't do is seal any areas where the old sealer has completely peeled, flaked, or worn off. 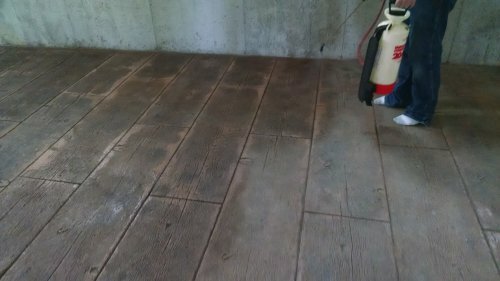 You might try a xylene application first, wait a few hours for that to dry, then reseal everything with a very light coat of new sealer. If you view the concrete at an angle and the surface has some sheen, it probably has some sealer on it. Another way to test for existing sealer is after the concrete has been completely cleaned, place a few drops of water on it. If the concrete immediately darkens, the sealer is gone. If the water beads up, even for a few seconds, there's still some sealer on or in the concrete. 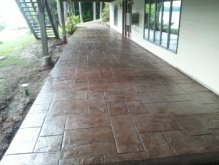 If your stamped concrete is just dull looking with no white spots or flaking, then just a simple cleaning and re-seal should be enough to make it look like new again. When it might rain the day after. I have less problems sealing concrete later in the day when the temperature of the concrete is going down versus sealing in the morning when the sun is warming the concrete up. If you seal in the morning, the concrete could have some moisture in it just from the dampness in the overnight air. Ever seen that moisture (dew) on your grass in the morning. Then as the sun warms up the concrete, the moisture will escape the concrete as vapor. If you seal the surface, the vapor could cause blisters, bubbles, and blushing.